Who would guess that a firefly is among the most dangerous vampire in the world? In southern Togo and Ghana, the Ewe people have a myth of such a vampire, called the Adze. 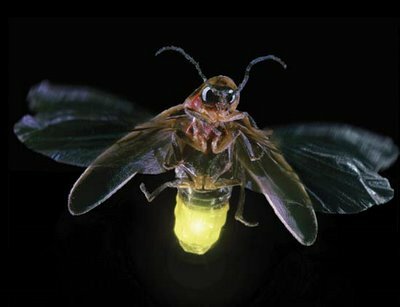 The Adze is a type of vampire creature who turns itself into a firefly or other insect to feed before returning to its human form. They can transform themselves into any number of common insects which are seemingly harmless, and very difficult to capture. The Adze have a taste only for the blood of the innocent. They are hunters of children, and only children, and they especially like to feed on infants. They can also feed on palm oil and coconut water, and often will raid a villageâs entire supply of these, but they become dangerously weak if they do not feed on the blood of children. An Adze can sustain itself without needing to kill any child. It can take enough blood to survive. However, if the Adze is deterred or thwarted from feeding for a long enough period of time, it will go on a ravenous frenzy for blood. Often when the vampire reaches this stage of hunger, even the victims who survive become infected with a deadly disease which eventually kills them.